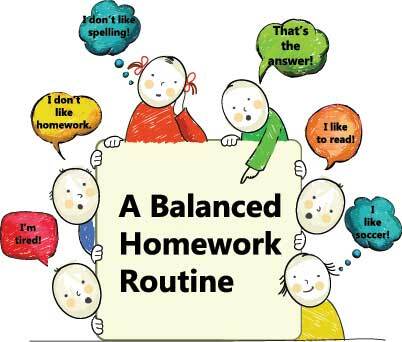 Balanced Homework Habits - Good Parent Inc.
Teachers, parents and administrators have been unfairly pitted against each over homework wars. The answer is not all or nothing; it’s a balanced and sensible homework routine. This leads to productive, well established habits that all students can take with them into high school and college. The Learning Habit is based on years of research and interviews with elementary and middle school teachers who have been actively involved in the development and implementation of their schools’ new curriculum. All students work at a different pace. Think big picture. Forcing a child to complete a homework assignment, after they have spent a reasonable amount of time on it (10 minutes per grade), is not promoting balance. Keep academic homework time balanced and consistent. On nights children don’t have schoolwork, they will read. Reading is important for both ELA and Mathematics. No tears policy: When kids feel frustrated or don’t understand an academic assignment, they can choose to read a book instead and ask the teacher for extra help the next day.